The Hadrian was run by the Edgar family; I went to school with their son Michael. He and David Dawson (Dawson’s the Chemist) and I formed a terrible trilogy in primary and junior years; so apart from visiting the shop on errands, I was always in there with Michael and David – generally up to mischief. It was yellow; I’m sure that is a fabrication of time but that is how I remember it. Bacon slicers being adjusted according to the instructions on the note I carried from Mother; chunks carved from casks of butter and wrapped in greaseproof paper; Mr and Mrs Edgar were some of the cheeriest folk I met; retail was once an enthusiastic enterprise, thank Heavens for Clough’s and Rington’s upholding the tradition; time will always tell, will it not? Strangely enough, just last month a lady charting her family tree found a second cousin of mine through internet searches, and she turned out to be our second cousin too; she grew up in care (nuns) and eventually married out of the area, but conceive my astonishment when I discovered she had worked in the Hadrian on Heaton Road at the very time we were shopping there. Of course we only ever knew her by her first name so a connection was never made. I’m contacting Michael Edgar to request a contribution to the story. Pick a tenant sympathetic to the shop and area.there won’t be another letting agent.Perhaps some suggestions ? Thank you for the update. The shop looks great. Looking forward to finding out what it will be. Did notice yesterday though a typo in the sign writing at the bottom on the right. 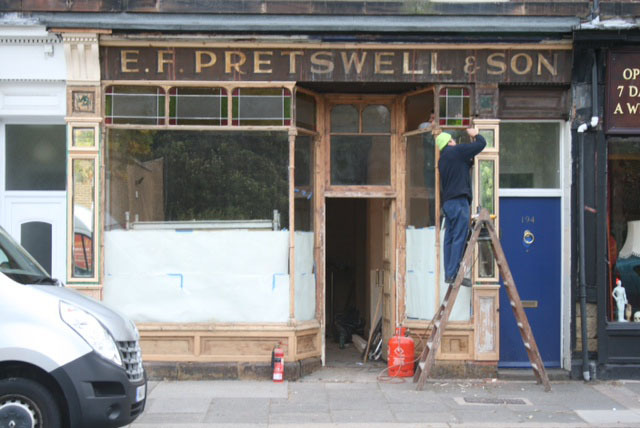 It says ‘Prestwell’ instead of ‘Pretswell’! Great job you’re doing Neil: you’re a credit to the neighbourhood. My wife and I live in the house in Wandsworth Road that Mr. Pretswell bought on 27/01/1894. We have the convayance signed by him, Addison Potter and a Mr Douglas. Thank you, John. It’s always really interesting to hear from people with the original deeds. They can give a useful insight into history. Neil… what a fantastic restoration ! Chris, I didn’t know that E.F. junior had been to South Africa, his elder brother George went there in 1900, to the Boar War, I wonder if they met up ? John, I have passed your house several times, its where my grandfather Norman senior was born, he later lived around the corner in Cardigan terrace. My Dad (85 years old) and Aunty (87 years old) remember the shop when ‘Uncle Ted’ ran it, and are amazed at what they are seeing now. David, as I lived in Heaton Park Road from 1950 to 1970, i well remember Pretswell’s removal wagons and the trade sign outside the house on the North side of Cardigan Terrace. It was a few houses along from the house where Sharkey’s Taxis used to mend their cars. 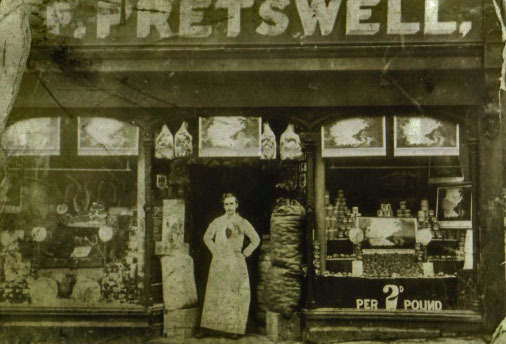 Later, in the 60’s I remember Pretswell’s sign outside of a property on the corner of Benton Road and Cragside. E.F. Pretswell didn’t own our house for very long, but I’ve seen that another Pretswell lived in Wandsworth Rd. in the 1900’s. Maybe it was his son? John, E.F.Pretswell junior lived across the road from you at one time. As a teenager, along with my cousins and brothers, we had an introduction to working life on the vans, it used to be quite a workout ! My Mum and Dad had the house on Benton road. 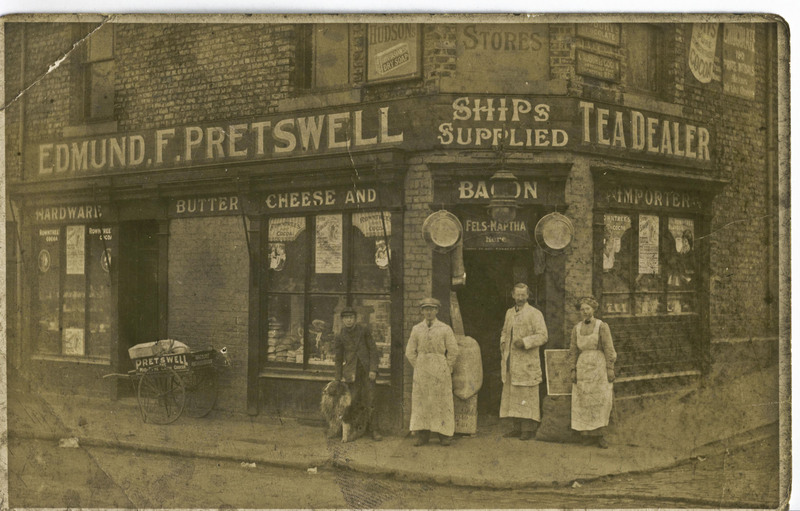 Have added another lovely photograph of an EF Pretswell shop to the article, kindly provided by Edmund junior’s great nephew, David. Michael Edgar, son of Albert and Doris Edgar who managed Hadrian Supplies, told us his parents met working at the chain’s Gatehead branch and remembered there was a shop on Chillingham Road and Shields Road too. He remembered, as a boy, helping his dag bag sugar and cheese and told us that at the back of the shop, there used to be a large, hand painted panel depicting a section of the Roman wall. The business was taken over by a supermarket chain in around 1968 and briefly became an independent grocer’s again shortly afterwards. Michael still lives in Newcastle. Hi there. I love all the research that’s going on – thank you for starting the group and sharing your research in this way. I’m very much enjoying being a member. I have a dream to have my own business in Heaton and I’d love to know what kind of business the community would like to see in a shop like this one? Something other than a cafe or letting agents would be nice! Deli? I could see a demand for good quality produce, even if prices are high. But, beware, Heaton Road is not the shopping centre it once was. Chilli Road is more popular, but all small shops in Heaton are “in the shadow” of Morrisons, Asda, Tesco and Sainsbury. What Heaton certainly does not need is another take away or cafe, as Victoria Morland said. Hope you are successful. Is 188 Heaton Road for let yet? I’m potentially interested, but in the early stages of consideration! I’d be interested in rates etc. Thanks Chris ,looking forward to this one,things look promising so far. Shopfront intact apart from rot on the lower paneling ,we still have plenty of old wood in stock,and intend to make true to the original. City council,maybe we will get some support off them to make Heaton road more attractive . Hadrian Supply Company also had shops in Morpeth, Consett, Blackhill and Blackfyne. My father was manager at the Morpeth shop pre and post war ( Served in RAF) before moving to manage the much larger shop at Consett. These shops were all conventional ones with counter service. Consett also had local delivery of orders by van. He then moved to Whickam shop which was the beginning of the the move to Isle shopping. Hadrian Supply Company was taken over by Safeway which was later taken over by Morrisons.